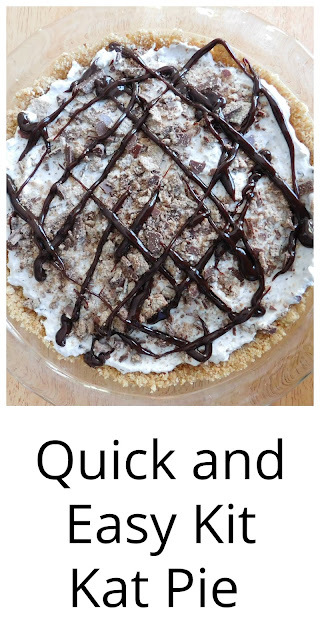 We were looking for a new pie recipe to try out and I thought it might be tasty to come up with a candy pie using Kit Kat bars. I just love Kit Kat bars! 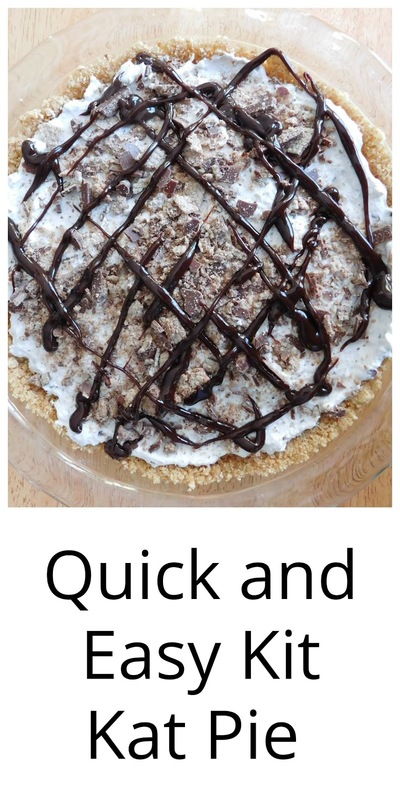 This no-bake pie was delicious! I was afraid the bars might not hold their crunch but they did! In a medium bowl I combined all the ingredients for the pie crust then pressed the crust along the bottom and sides of my pie plate. I set in the refrigerator to harden as I began preparing the filling. I whipped up the cream cheese in my stand mixer and added in the cool whip. I carefully measured 2 1/2 cups of Kit Kat crumbs into my measuring cups and gently folded them into the mixture. I poured a 1/2 jar or so of the hot fudge into the bottom of my pie and let it cool for a few minutes. Once the hot fudge was sufficiently cooled enough not to melt the cream cheese or cool whip I spread my filling into the crust. I topped the pie with the remaining 1/2 cup of Kit Kat pieces. I poured the rest of the hot fudge into a zippered freezer bag and snipped off one corner allowing me to pipe hot fudge across the top of the pie. It not only looks pretty; it tastes amazing! Hi, visiting from Across the Boulevard link party! :) This is such a great idea, it looks like an awesome pie and I bet the flavor is amazing too! Have to love Kit Kat, thanks so much for sharing, pinning too! It was very flavorful. Thanks so much for the comment and pin. Hi, found you via Across the Boulevard Link Party! Your pie looks totally amazing :) pinned too, thanks so much for sharing! That looks super yummy! Think I'm going to try making it sometime soon. It was so nice and easy to make too. Thanks so much for pinning and sharing Marilyn. Your Kit Kat Pie looks tasty! Thanks for sharing at Snickerdoodle. This was the most clicked from last week's party and all of the co-hosts will be featuring at today's Snickerdoodle Party. Oh my this sounds so rich~ What a wonderful company's coming dessert! Thanks for sharing at the What's for Dinner party!! Have a fabulous week. It would be perfect for company. Your Kit Kat Pie looks fantastic! Thanks so much for sharing with us at Full Plate Thursday and hope you are have a great week!